Saturday night at 8 p.m. can mean only one thing: It's time for the Comedy Cavalcade, starring King Kaiser! The year is 1954, and the new giants striding the entertainment universe are the stars of live television. This sweet and funny movie is both a love note to that time and place, and an earnest tale of one man's influence on another. Curiously enough, given the movie's title, all the action takes place in one week, when Alan Swann, aging movie matinee idol with a weakness for Courvoisier, is slated to be the special guest star on the Comedy Cavalcade. Benjy Stone (né Steinberg), the youngest writer on the show, is assigned to be Swann's keeper, and the relationship between the two is at the heart of the movie—it's like a buddy picture starring Errol Flynn and Woody Allen. Peter O'Toole plays Swann, with tremendous swagger and swashbuckling energy—he knows just how to turn on the charm when he needs to, and is keenly aware that his celebrity will allow him to get away with just about anything. Mark Linn-Baker is Stone in this, his debut film, and much of the movie lands squarely on his shoulders—he is, happily, up to the task, and the camaraderie between these two is funny and specific and memorable. This may not be the greatest comedy ever put on celluloid, but it's hard not to have an enduring fondness for it, and it holds up remarkably well; that seems to be so both because of the film's optimistic outlook, and the filmmakers' own familiarity with both the worlds of 1950s television and the New York of the period that produced so many comic geniuses, including Mel Brooks, whose company produced the film. There's a great set piece in which Stone brings Swann home to Brooklyn for dinner—Benjy has changed his name for show business purposes, and his mother cannot understand why he would swap up Steinberg for Stone. The sequence is on some level the family nightmare of everybody who goes into show business, with screen royalty showing up and getting badgered for autographs by Uncle Morty, and all the neighbors just happening to pop by for a look at their idol. The encounter drives Swann back to drink, and truly you cannot blame him. The movie itself isn't always relentlessly funny, but O'Toole is just absolutely brilliant. He's alternately dashing and a fool, charming and vulgar, perfectly presentable and ready to throw up on your shoes, and O'Toole makes it all work with tremendous panache. He's aided no doubt by being the proverbial fish out of water, the only Britisher in this world of New Yorkers, the icon of a passing era participating in the new entertainments of the coming one. It's a lovely, funny, heartfelt performance. A couple of story points seem pasted on merely to tie things up, but they're serviceable enough, and not too intrusive. One of the staples of Comedy Cavalcade is a sketch based on a mafia don named Boss Rojeck, portrayed on the show as Boss Hijack—Rojeck is none too happy with being made fun of on national television, and when his lawyer can't get Kaiser to cut the sketch, Rojeck sends in the muscle of the operation. We learn late in the story that Swann has a young daughter, Tess, who lives in Connecticut and whom he hasn't seen for more than a year; we're told that they kiss and make up, but I don't know that this adds a tremendous amount to our appreciation for Swann and his situation. The climax of the story isn't loaded with belly laughs, but as with much else here, since the movie has built up a reservoir of good will, as an audience member you'll probably go along with it anyway. Occasionally the pacing and cutaways can seem a little too sitcommy, but maybe that's to be expected given the subject matter. The cast is rounded out with great character bits, including Joseph Bologna as Kaiser, the boss with whom no one wants to make eye contact. He routinely goes into rages, and then makes it up to his employees by sending them a box of steaks, or a set of whitewalls. Bill Macy is the acerbic head writer who is cowed before King, and especially good is cranky old Selma Diamond as the wardrobe mistress on the show. Image Transfer Review: Colors are nicely saturated and the black level is respectable, but a fair amount of blemishes and debris interfere with the picture quality. Audio Transfer Review: Unfortunately the only audio track is a mono one, and while the dialogue is all clear enough, there isn't much nuance to the sound. Click on over to the French soundtrack, which is especially fun for the scenes set in Brooklyn. Extras Review: Director Richard Benjamin's commentary track is the main event here�he obviously retains a great fondness for the movie, his first directing credit, and talks about it as "a valentine to New York City." He's obviously not from the Stanley Kubrick school of shooting and shooting and shooting some more: "Something's wrong if there are too many takes." Benjamin is especially fun talking about O'Toole, whose participation got the movie made, and he recalls with glee the reactions of the locals when the film was shooting in Brooklyn—as O'Toole made his way to the set, neighbors were bellowing at him from their windows: "Lawrence! Lawrence from Arabia! Up here! Apartment 3B!" O'Toole's is the sole filmography, and the original trailer features voiceover work by Mason Adams. 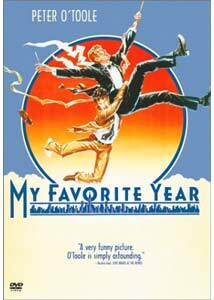 A sweet and charming movie, it's hard to resist My Favorite Year. O'Toole's spectacular performance and a genial commentary track from Richard Benjamin make this a DVD to savor.